Are you an old dog? You can still learn a few tricks. Set out this year to gain a new skill or go deep into something you find fascinating. 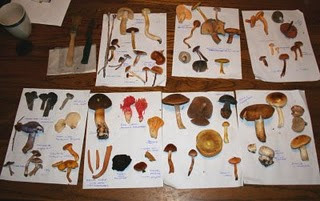 Take a class on wine pairing, conversational Italian, mushroom identification. My very inspiring friend Chareane seems to add to her repertoire of wisdom and talent each year: so far since hitting a landmark birthday she's taken up accordion and samba, among other arts. To bind two birds with one story (killing birds seems a little harsh), practice last week's resolve of connection by looking for a mentor. Know someone who can make a great pie crust or loaf of bread? Ask them to share the wisdom. Know how to tune up a bike or tailor? Make a trade. Pick something new this year to investigate. There are great community classes through parks and rec and LBCC to teach you everything from Tai Chi to making a webpage. Get going! Lifelong learning is good for the brain and good for the health. It can keep your memory sharp, increase your connections to others or create them, provide cheap entertainment, and depending on what you learn, even save you money as you learn to do for yourself. Song of the day: OK, I'm stumped. Anyone have a suggestion for today's song?